Throughout the season, we've seen Michigan's young linebackers and defensive ends struggle to hold the edge and properly funnel running backs to the support. Logically, discipline from the linebackers was a key to success against Northwestern's offensive attack. On the Wildcats' first touchdown Saturday, they exploited that inexperience with the triple option. 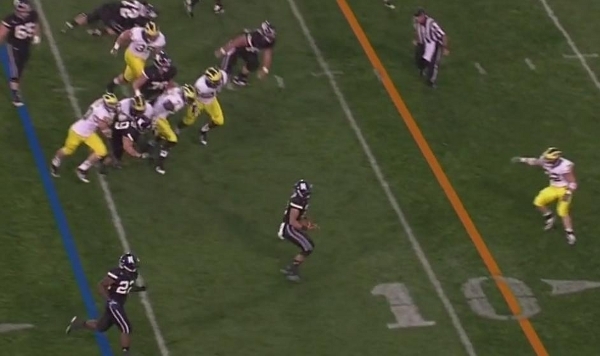 It's second and six, and Northwestern is trying to respond to Michigan's opening-drive touchdown. 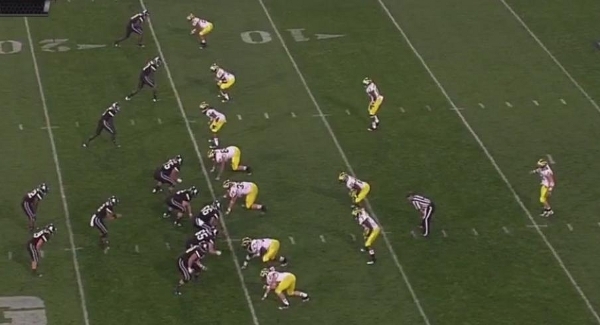 They align with trips receivers to Persa's Kain Colter's left (EDIT: the backup QB subbed in for Persa) and are in a strange formation that I'll refer to as the Pistol T. Michigan has their nickel package on the field and is in man coverage. Jake Ryan has his hand on the ground as the weakside defensive end. As the ball is snapped, Ryan is left unblocked. Northwestern is running the triple option here. Currently, Colter is reading Ryan and will decide whether or not to hand the ball off for the RB dive. The running back to Colter's left is swinging behind the mesh point to act as the pitch man if Colter pulls the ball. ...whoops, Colter pulls the ball. The right tackle and guard are releasing to the second level and about to smother Brandin Hawthorne. Poor Jordan Kovacs. He now stands as the only player between the ball and the endzone, trying to defend a pitch option. He's hopeless, as anyone would be facing this scenario. Colter cuts back upfield and runs untouched into the endzone. Blame for this play falls on one of two people--Ryan or Hawthorne--and it depends on how the team was coached. At first blush, this seems like Ryan's fault for not holding the edge. However, it's possible that Hawthorne should have scraped over the top of the play. Unfortunately, we don't know how Mattison prepared the team for this play, but given Hawthorne's complete disregard for the option, this was either a terrible read by him or Ryan should have kept contain instead of attack the dive play. I'm inclined to say the latter. While the linebackers are young, these are problems that need to be corrected soon. Northwestern is known for their triple option, and being this unprepared (or possibly just having a huge brain fart) is not sustainable for the future. With four of Michigan's remaining six opponents (Purdue, Illinois, Nebraska, Ohio State) featuring either running quarterbacks or packages for running quarterbacks, correcting these issues will be crucial. At the very least, this acts as a coaching point for the inexperienced linebacker corps. The QB was Colter on this play, not Persa. I was pulling my hair out at this play. It's something I've been watching ever since MGoBlog pointed it out at the beginning of the season. I hope it gets corrected before seasons end. Bah, good catch re: Colter. Edited. How does the fact that Will Campbell beat his block and is about to eat the dive-back change what Ryan does on this play? I'm not sure he's capable of knowing what's happening with his teammates as he's trying to determine which guy to defend. Also, doesn't it make more sense to have your DE always hold the edge, at least against a team like NU? I would think that having the lead back run straight into the middle of the formation where there are 2 DT and 2 LB is a lower risk situation than having two offensive players get out on the edge with one of your LB required to read, scrape, and beat them to the edge. Finally, can you follow up on this post with any adjustments made later in the game to limit the effectiveness of this play? What Will Campbell does(n't) do has no bearing on how Ryan should defend this play because, as you correctly point out, he can't know what's going on with the other players in real time. The way to defend this is either to have Ryan crash on the dive play and Hawthorne scrape over the top, or have Ryan maintain the edge. As for always having your DE hold the edge: option coaches/coordinators make their living on teams that do this. If you instruct the DE to always play the QB, offenses start using, for example, pulling linemen to kick the DE out and create running lanes. This is what makes Rodriguez and Paul Johnson such effective playcallers: they always have counters and ways of negating defensive strategies that always do the same thing. 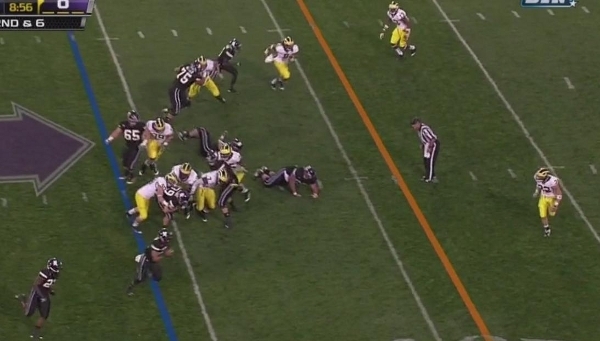 Also, it should be noted that the dive play isn't sending a running back into a pile of bodies. By not blocking the DE, the offense gains a huge numbers advantage. 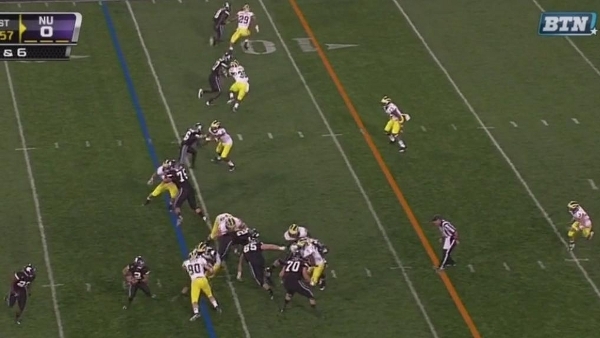 Though Campbell beats the block above, he's being double teamed before the right guard can release to the second level and block Michigan's linebackers. 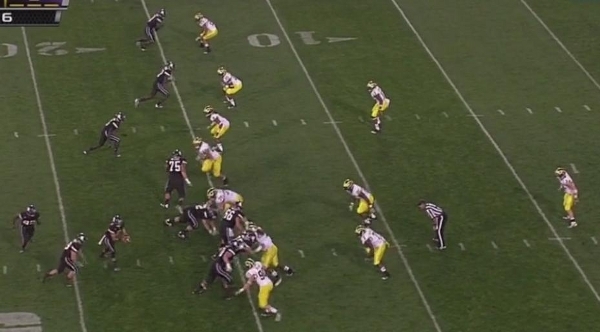 And yes, when I'm watching the game again tonight, I'll look for similar instances where NW runs this triple option and see how Michigan defends it. 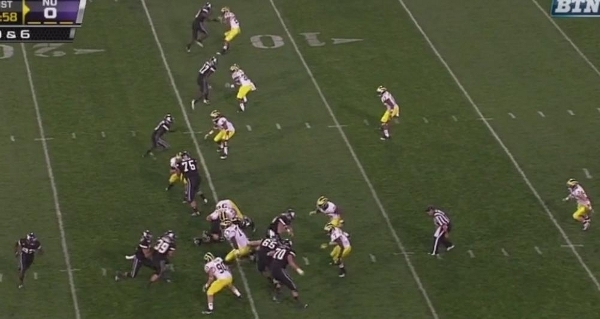 Did you notice that the right tackle was uncovered on this play? That means that the outside slot receiver (who is lined up on the LOS) was *not* an eligible receiver on the play. So technically, Thomas Gordon could have ignored him when he released downfield. (His downfield release would also have tipped off that it was a run play). I'm guessing formations like these are one-offs and not something you can prepare for. Further, since the run went to the right it didn't effect the outcome of the play. But it sure is interesting. By the way, as noted at MGoBlog (http://mgoblog.com/content/tuesday-presser-transcript-10-11-11-coordinators), Ryan was assigned to play the quarterback. Mattison prepped the team for the DEs to keep contain. This is definitely something you can prepare for. The triple option is a staple of Northwestern's offense, and as linked upthread, MGoBlog asked Mattison at his press conference whose responsibility was whose. Ryan was supposed to keep contain here but cheated and got caught. You can certainly prepare for the triple option itself. The question I raised is whether Northwestern regularly utilizes that formation in which a WR is ineligible by design, and whether a response to the idiosyncrasies of that formation can be part of defensive game-planning. I can't believe that the formation is used too often. For crissakes, the right tackle is uncovered! If I were on defense I think my natural initial assumption would be that the formation was illegal.